Earned a B.A. in 1985 at Mount Holyoke College in South Hadley, Massachusetts. Double major in Economics and Russian Language & Literature. Studied in Moscow for one semester during the Cold War: Aug-Dec 1983. Performed work/study all four years of college: Freshman year as dorm pot washer; sophomore-senior years as administrative assistant in college’s Department of Russian. 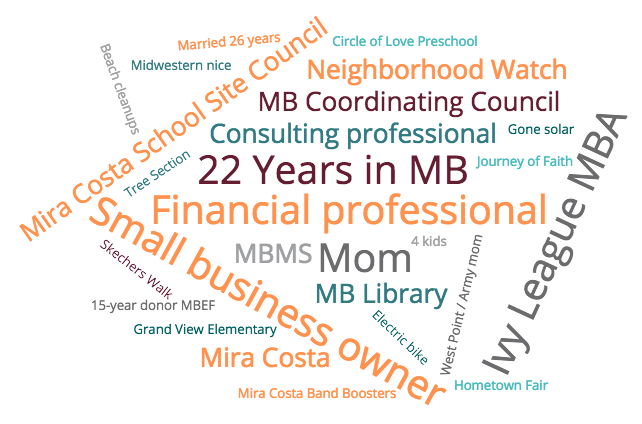 Mother of four great kids, all educated within MBUSD: Grand View Elementary, MBMS, and Mira Costa. Our son is a graduate of the U.S. Military Academy at West Point and second lieutenant in the U.S. Army. Our oldest daughter is a former NCAA Division 1 scholarship gymnast and a senior at the College of William & Mary. Our second daughter is a college sophomore in nursing at the University of Michigan. Our youngest daughter is a senior at Mira Costa.